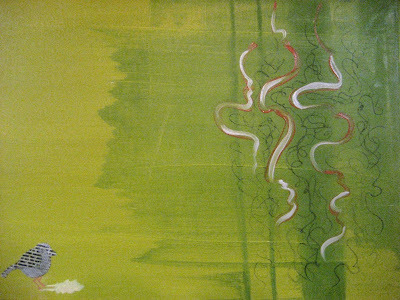 The busy summer months haven’t left much time for blogging here at Miro Tea, so I’m here to quickly introduce this month’s artist and mention that this hot (for Seattle) weather is perfect for enjoying iced tea…feel free to stop by, check out Aba’s art, and try one of our Green Tea Mojitos or an iced tea latté or chai! supporting himself and his family. June is already upon us, which means we’re showing new art! It’s a real pleasure for me to introduce our June artist because she’s a close personal friend. Courtney Morgan is a Walla Walla native. She majored in art at Whitman College and recently received an MA in design studies at Central St. Martin’s College of Art and Design in London. Her show, titled “Please Clap Your Hands,” is a collection of oil paintings inspired by a visit to a friend’s farm house in Denmark, the colors in a display case at a Florence gelateria, and song lyrics. 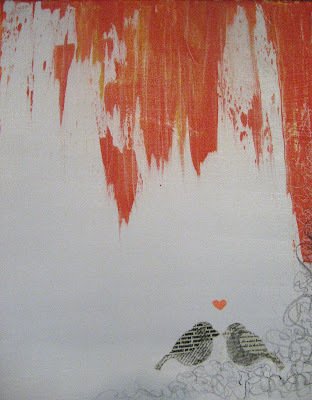 She describes her paintings as clean, bright, hopeful and poignant. The bright, lively colors are looking great in Miro Tea’s space, and I’d add that Courtney’s inimitable sense of humor is also evident in spades. As usual, the Artwalk event opens the second Saturday of the month–many Ballard businesses will be showing art as well. In celebration of Courtney’s opening, we’ll also be featuring some live music at the event. Performing this Saturday night will be…well, er, me. 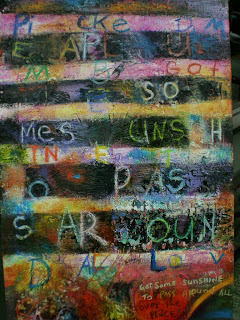 Since my lyrics are integrated into some of Courtney’s paintings, I agreed to emerge from self-imposed exile to perform. I’ll be joined on”stage” for a few songs by another Miro employee, Nick Arthur. I hate to have to describe my own music, so I’ll say that I write and sing songs, accompanying myself on acoustic guitar. The songs I write are sometimes difficult to box into tidy genre categories, but things that are important to me as a songwriter are lyrics, interesting guitar parts, and experimentation. I’ve been making music for about 8 years and performed quite a bit in college but have lately been sidelined due to some health issues with my vocal cords. Courtney’s opening is a special event for me, though, so I’m ecstatic to be able to participate. I’ve got a song sample on my Myspace for anyone interested. The art opening and music will go from 7-9 pm and should be a really fun time. For any readers out there who aren’t already aware, many businesses in Seattle’s Ballard neighborhood participate in a monthly event called “Artwalk.” Basically, businesses host local artists and display their art on a monthly basis, and the second Saturday of each month is the official “opening,” during which most businesses host receptions and the artists are usually there to represent their work. Miro Tea has been hosting art every month since we opened, and our blog is an excellent way to get a little bit more information about our artists to the public. This May’s artist is Winston Haycock. I had the pleasure of meeting Winston yesterday when he came in to hang his art. He’s got a great energy and it really translates well to his art–our walls are looking fantastic with lots of bright, stimulating color. 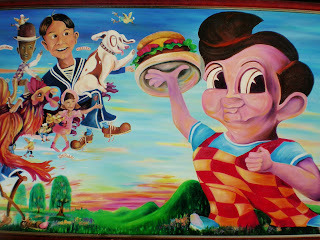 Included here are some samples of Winston’s pieces that are currently hanging at Miro, as well as a few pics of some “pop nostalgia” pieces Winston also wanted the public to see, along with Winston’s bio. Please feel free to stop by and meet Winston at this Saturday’s opening–the Artwalk event officially lasts from 6-9 pm, and Winston’s art will be up all month! Winston Haycock has been creating multimedia paintings since 2000 when he discovered the fun of seeing different paints react to one another, changing their original form into something quite different with each experimentation. He has made over 1,000 of these paintings and can’t wait to get to the next body of work after a series has been finished. 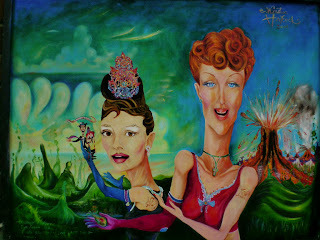 He is getting quite known in the Pacific Northwest for this style and also enjoys painting pop style oils based in the nostalgic vein, which he calls his ongoing Sinatra Series, a style inspired by his landscape-painting mother, Velma Young, who brought him up with classic movies from a very early age . She taught him the landscape and how to use a palette knife, and he eventually learned (he is a self – taught artist) photo realism in pencil and graduated to brushes and oils. 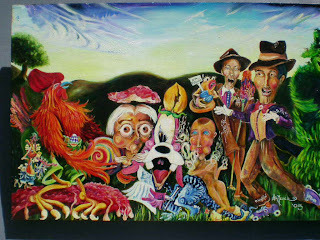 Winston focused on the portrait from the urging of his father, Dave, and eventually was painting famous people in surreal group landscape settings, some in a sort of a children’s storybook fantasy land, and others from real movie still photos . 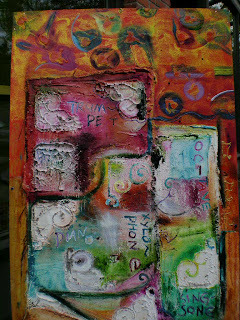 He made his first abstract multimedia piece in 1999 using coffee beans encased in wax, and found the mixed media a welcome break from the very crisp, tight lined nostalgic oil work, so he started having shows mixing the two styles together. He now keeps each style separate when having a show, and the current opening he is having on May 9th is no exception. 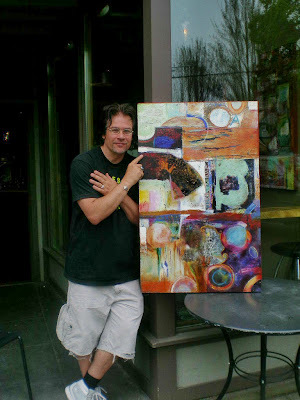 This will be Winston’s 33rd artist reception and the show is indeed whimsical, focusing on his new Hidden Poem series, he includes his new flat oil abstract series and new patina copper series, all together a very highly textural and colorful show. 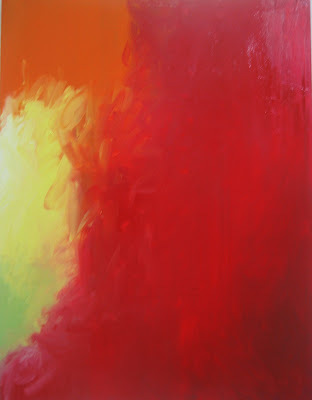 The flat oil abstracts were inspired by a recent commission from a family member, and the copper patina color ties the whole body of work together and makes the show complete. 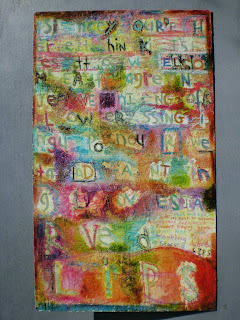 Encompassing the full spectrum of color and playing with ” text”(ing), Winston gives the public a very childlike but sincerely thoughtful show of decorative fun pieces, which have been doing very well in the Ballard area. 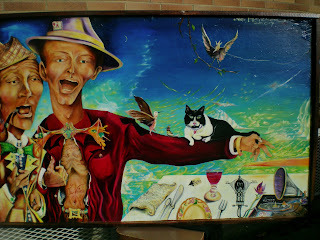 His media include common table salt, wood stain, aluminum foil tape, caramel colored hide glue, roof tar patch, drywall cement patch, oil bar, airplane enamel, ground marble and glass, encaustic beeswax/oil bonding and many other mixtures of interesting paint, including Japan paint and acrylic gel. Winston’s work is reasonably priced ($80-$120) because he can make about 20-40 pieces each month. The work is often 3 feet in length enough room on the wood panels he uses to show what different paints do when mixed in unorthodox ways, but not too big to find a spot above your piano or sofa! Winston is currently illustrating a children’s book about his cat Francis Mcoullagh for Random House, and also paints wine labels for wineries in eastern Washington, where he has a permanent show of ongoing work at the 6th Street Gift & Art Gallery in Prosser, WA (509-786-3088). 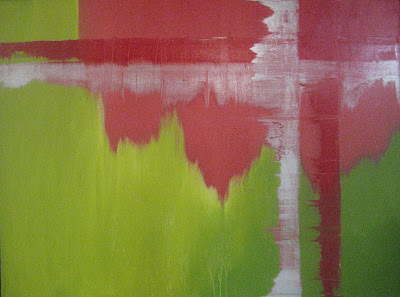 He can be reached at home in his studio at 206-588-0222 or by email at winstonhaycock@gmail.com. Tea drinkers who get their news online may have already seen this recent article, which describes a scientific study that linked regular steaming hot tea drinking with an increase of esophageal cancer. The study took place in Iran, where black tea drinking is widespread in its popularity. Interestingly, the study found that drinking tea at ‘steaming hot’ temperature (between 149º and 159º F) doubles the risk of cancer, and drinking tea at temperatures above 159º F increases the risk eightfold! Of course, once I read this, I broke out the thermometer and quickly started experimenting with drinking water at different temperatures. Personally, I find that the temperature at which I like to drink tea is generally below 150º; I tried 160º water and, not surprisingly (I don’t have an especially high tolerance for hot drinks) it was a little too hot for my tastes. The study also notes that most cultures that prefer to add milk to their tea don’t have an especially high instance of esophageal cancer, most likely because the milk cools the tea to a lower temperature. Of course, this is only one study, so we should probably wait for more evidence before taking it as scientific law, but it does raise a few interesting points. I think it’s a good reminder that, ideally, tea can be an opportunity to relax and make a concentrated effort to take a short break in the day to sit and enjoy the intricacies of a delicious beverage–waiting a couple of extra minutes for your tea to cool can be an opportunity to get your thoughts together and focus on what you need to get done for the day, or it could just be a chance to anticipate the tea you’re about to experience. I know some people feel like “the hotter the better,” but I find that a really complex tea’s flavor is usually much easier to appreciate if it’s had a chance to cool down a little. Finally, I think this study exhibits one of the most difficult aspects of scientific tea studies–the tea drinkers in the study all consumed black tea. It seems to me that with the effects that different processing techniques have on the composition of tea leaves, combined with the different methods used to prepare the teas, it must be a bit difficult to generalize anything about tea without meticulously including all different tea types in a study. That is to say, for example, does drinking steaming hot oolong affect cancer risk in the same way? Studies that focus on the health benefits of tea have returned some pretty solid evidence that the different tea types at least have different strengths when it comes to health benefits, so I think it stands to reason that they might show slight physiological differences in other studies. Reading tea studies is always exciting, since each study is another link in a growing chain of evidence that helps us make more confident claims about how tea affects the human body. Unfortunately, because of the variables involved, tea is such a complicated, multifaceted subject that it will probably be quite a while before we’ve mastered it as a subject. There are, however, a few general items that seem reasonable to say regarding caffeine content. Factors that seem to indicate high caffeine content in tea include: Higher quality leaves (generally the buds and first leaves), large amounts of nitrogen fertilizers, species of tea plant (assamica plants have shown higher caffeine content than sinensis), the condition of the leaves (broken leaves expose more surface area to the water), longer steeping time, and higher water temperature. However, it’s not even as simple as tallying these variables–high quality leaves usually contain more theanine, a compound which has been shown to act in a way that is physiologically contrary to caffeine, for example. Another factor that I think is often overlooked is that many people report that the caffeine in different tea types (green, white, etc.) affect them differently. Combining these physiological factors with the dearth of scientific evidence on the numerous other factors, if we were to claim that, say, our Meleng Assam has more caffeine than our Sencha, it would be an almost laughable proposition (if it weren’t so irresponsible). So, what is the best way to approach this complex subject when customers ask questions? I honestly feel sympathetic for the tea companies who take the easy but inaccurate way out when spreading inaccurate information about caffeine–it’s tough to provide ambiguous answers in a customer service situation–but honesty and transparency are key principles in good customer service relationships, so I can’t condone oversimplification for the sake of brevity. I prefer to concisely explain that tea’s caffeine content is much more complicated than popular sources let on, and that the number of contributing factors and the cost of testing make determination of caffeine content very difficult. If a customer is extremely concerned with avoiding caffeine, I recommend botanicals or rooibos–complete abstinence from caffeine is a sure thing. Otherwise, I’ll recommend that the customer try whichever tea they’re interested in the morning and take note of how effective the caffeine is for future reference. The one situation in which I feel confident describing a tea as “lower in caffeine” is when the tea is a blend with a significant amount of botanicals. Since we measure our tea by weight for each serving, teas like Genmaicha and Masala Mint Green contain, gram-by-gram, less tea leaves than pure tea blends do, so there will obviously be a lower caffeine content. These are about the most concise answers I can think of that sacrifice the least accuracy. Luckily, we also have this blog as another medium for a slightly more suitably detailed (though still not really scientific) description. If your scientific appetite has been piqued at all, I encourage you to check out the venerable Cha Dao Blog’s past posting Caffeine and Tea: Myth and Reality, to which I’ve made general reference a couple of times in this posting. The article is pretty academically rigorous and it includes citations of the existing relevant studies and figures from their findings. Also of note is the ensuing discussion in the entry’s comment section, which continues the myth-busting spirit of the article in several meaningful ways. I hope this posting has been at least a little illuminating about this difficult subject–hopefully the next few years will see the publication of some more relevant scientific studies so the “mystery” aspect will diminish a bit. Please join me at Miro Tea every Sunday from 1-3 pm for complimentary guided tea tasting. During the two-hour period I will be sampling any number of our 200+ teas–what we taste is up to those who are participating in the tasting, so it’s a great opportunity to learn about the differences between the major tea types, compare the small differences between very similar teas, or learn to appreciate the process behind gong fu tea brewing. These tea tastings are also a nice chance to learn a bit more background on the history and processing of some of your favorite teas. Sundays are a great day to drop by Miro Tea–the year-round farmer’s market is bustling on Ballard Avenue right outside our front door and the entire neighborhood is very lively and busy. Please take a relaxing stroll through the market and stop by Miro afterward–I’d be delighted to share a cup of tea with you! We’re excited to announce that Miro Tea has been mentioned as one of the West Coast’s top ten tea houses in January’s issue of Sunset magazine. 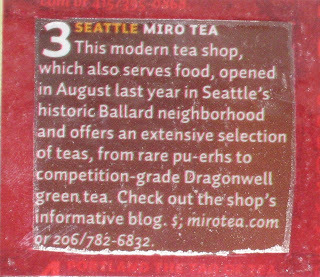 In the short paragraph, Miro was listed as the #3 tea house and this blog was even mentioned! If you’re visiting our blog because you read the Sunset article, welcome! I hope you find the back catalog of postings helpful in your tea journeys, and feel free to ask any questions you may have. I usually don’t have complete answers, but am happy to help search them out! For me, the chance to continue exploring and learning about tea is the best part about writing this blog. See you online, and maybe even at Miro Tea! Welcome to 2009! To finish off the recent series of Wuyi Yen Cha posts, I’ve got tasting notes for our Rou Gui (which we call Wuyi Cassia). I’ll do my best to keep this post a little less long-winded than the Da Hong Pao tasting notes, but sometimes nerdy tea enthusiasm exceeds my restraint! As I mentioned in the introductory post, Rou Gui is both a “tea type” and a genetically unique cultivar of the tea plant. 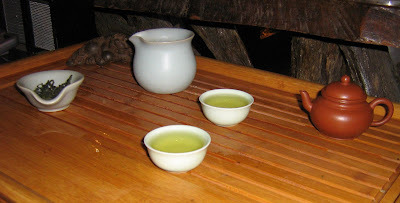 Although Rou Gui isn’t one of the four famous Wuyi oolong cultivars (known in Chinese as the Si Da Ming Cong–Da Hong Pao, Shui Jin Gui, Tie Lo Han and Bai Ji Guan), it is certainly one of the more common varieties and is often served at restaurants alongside Shui Xian as a popular table tea. In spite of its popularity, it’s still very much possible to find premium examples that stand up to elite gong fu grades of the Si Da Ming Cong. 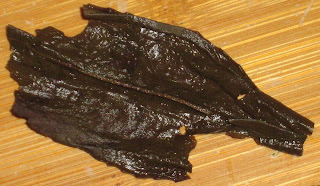 The dry leaves aren’t too different in appearance from those of the Da Hong Pao–nice big, whole leaves. They’re perhaps a bit darker with a little more contrast between the frosting and leaf color. Smelling the leaves after the first infusion, I notice that the roast seems a bit more dominant than with the Da Hong Pao. Similarly to the other tea, though, the roast in the aroma diminishes after a couple of infusions. If I had to use one word to contrast this tea with the Da Hong Pao, I’d use “darker.” The heavier roast is immediately apparent, and the characteristic Rou Gui flavor takes slightly more effort to appreciate. It’s there, though–“Rou Gui” is often translated as cinnamon or cassia–as the roasting character diminishes over the 2nd and 3rd infusions, a delightfully dark spiciness emerges. This tea’s acidity is nowhere near as pronounced as the Da Hong Pao’s is, and the body tends to be a bit fuller as well. Later infusions produce a balanced but fading combination of roast and spice, with the expected astringency getting my mouth watering. Compared with the Da Hong Pao’s high and penetrating notes, this Rou Gui’s full, round and dark bottom makes for a pleasant contrast. 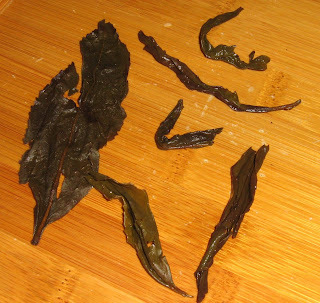 Examining the spent leaves shows some similarities with the Da Hong Pao–leaves alternate between very dark to slightly greener, but there are many large examples to be found. Our staff’s reaction has been split between these two teas–to me, that’s a sign that they’re both good! Personally, my tastes gravitate a bit toward the slightly lighter roast (you can see below that the Rou Gui’s leaves are more blistered than the Da Hong Pao’s), but the full body and darkness of the Rou Gui makes for an excellent and comforting winter warmer! At long last, I’m here to present tasting notes for our two new Wuyi Yen Cha. I started introducing this tea in an earlier post, so I’ll only add a bit more info with regards to its origins. 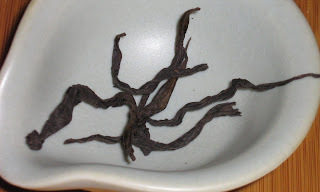 As I mentioned in that earlier post, Da Hong Pao is both a “finished” tea type and a genetically unique cultivar of tea plant. However, the history and origins of the Da Hong Pao cultivar are labyrinthine and hotly-debated. Guang at Hou De Asian Art has written two extremely illuminating articles about the origins of the Da Hong Pao cultivar (Part 1, Part 2), so I won’t go too in depth regarding the history. Suffice to say that, yet again, there are plenty of tea merchants in China who are willing to pass off cheaper, often inferior Wuyi oolongs as “Da Hong Pao” and selling them to ill-informed customers at much higher prices than they deserve. This problem is compounded by the fact that many skilled Yen Cha tea masters have different opinions about which cultivar is proper for making a Da Hong Pao. This makes Da Hong Pao shopping very difficult for consumers, especially in the West. After trying as many “Da Hong Paos” as possible, I’m beginning to gain a modest understanding of Da Hong Pao’s unique flavor profile. 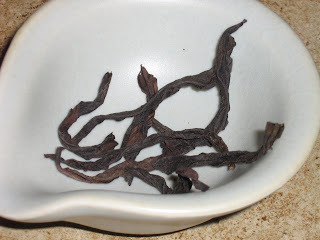 To me, Da Hong Pao is typified by a fruity, floral flavor that comes across as very “high,” and acidic (i.e. lively and stimulating in the mouth). Of course, these characteristics can vary based on the innumerable other factors involved in processing, but the best Da Hong Paos I’ve tried all seemed to exhibit this flavor while the others tasted like overly-roasted generic Yen Cha. 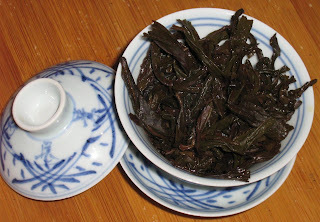 Outside of searching for Da Hong Pao’s unique flavor, choosing a good example is a matter of meeting the criteria that all Yen Cha should meet–balance between roasting and tea flavor, mouthfeel and body, and aftertaste. Enough tea geeking–let’s move on to the task at hand: tasting our new Da Hong Pao! As you can see in the above picture, the leaves are large, complete, and dark in color with a light frosting. 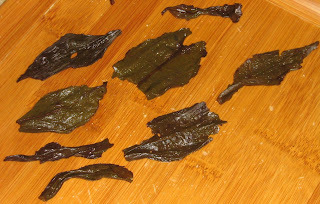 Large, complete leaves is a good sign–it means the tea has been handled with care and will be much more forgiving when brewing (broken leaves make strong, astringent and bitter tea much more easily). After loading up the gaiwan and pouring off the first quick infusion, the leaves smell incredible–the roast comes through first in the aroma, with a gentle, warm charcoal note which is followed (especially if you inhale deeply) by a pointed touch of flowers. As the infusions wear on, the roasted aroma backs off quite a bit–by the second and third infusions, the floral and caramel notes begin to rival and overpower the roasted ones. The flavor of the initial infusions is less dominated by the roast. At the first brief steep, it’s nice and light, with a bit of acidity edging in. Later, the acidity comes into its own, combining both aspects of fruit and flowers in a way that is unique to Da Hong Pao. The final infusions begin to taper off in strength at just the right time–right when you’re ready for the tea to back off. As you can see in the picture the infused leaves are a sight to see! Even with multiple infusions, the leaves of a good Yen Cha will retain their stripe-rolled shape, never fully unfurling without help. The unfurled leaf on the left is MONSTROUS. By far the largest leaf I’ve found in so far in the entire batch–it measured 4 inches! Also of note is the difference in coloration–this tea’s heavy oxidation leaves some of the leaves greener while some take on a darker, brownish color. As you can see in the final picture of the gaiwan, by the end of a brewing session, the leaves are positively overflowing. In my experience, a lot of leaves is the best way to ensure a long session with a Yen Cha, but short steeps are a must. If you only want a couple of good steeps out of your tea, reducing the leaf weight and lengthening the infusion time will also provide very good results with this tea. Finally, I’ll draw attention to this close-up picture of one unfurled leaf. In the macro picture (please excuse my camera’s quality) you’ll see some bubble-like blisters on the surface of the leaf. This sort of appearance is evidence of the tea’s roasting level–lighter-roasted Yen Cha will show pretty much no bubbles on the leaf surface, while “traditional” Yen Cha will sometimes be covered in such blisters. If flavor alone isn’t enough to accurately reveal to you the tea’s roast level, inspecting a nice whole leaf is usually pretty reliable. “Traditional,” (in the parlance of Wuyi Yen Cha) means heavy roasting. As I understand it, most Yen Cha used to be heavily roasted, and lighter and lighter roasts have only more recently come into fashion. Today, “tradional” connotes a high roast. If the tea’s good, though, you should be able to taste and smell much more than just charcoal without trying too hard! I would consider this Da Hong Pao to be a Traditional-style Yen Cha, though its firing wasn’t extreme. Hopefully sometime in the future we’ll be able to offer a lightly-baked Da Hong Pao–the difference can be very educational and can be illuminating for entry-level Yen Cha drinkers who might think all Wuyi oolongs taste the same! Stay tuned for tasting notes for our Wuyi Rou Gui and, more importantly, have a happy new year!